Citation: Smith DC, Dart R, Hirst C, “Prevention Not Cure: Avoiding a European Prescription Opioid Epidemic”. ONdrugDelivery Magazine, Issue 88 (Jul 2018), pp 4-8. The opioid addiction crisis in the US and Canada is a pressing and immediate problem in today’s healthcare landscape. Damon Smith, Richard Dart and Christopher Hirst discuss the causes and possible solutions to the epidemic, as well as whether or not Europe is likely to face a similar fate. In the US, the number of people dying from prescription opioid overdose is shocking. The US Centers for Disease Control and Prevention estimates that, from 1999 to 2016, over two hundred thousand deaths have occurred this way,1 in 2016, 46 people died every day. Such marketing tactics also fail to account for Canada’s prescription opioid problem. Canada runs a very different healthcare system to the US, yet Health Canada reports that in 2016 there were almost 3000 opioid related deaths,3 which translates to about eight people dying per day. As the Canadian population is 10 times smaller than the US, these figures are alarming. Arguments that Europe is immune to an opioid crisis because of its different prescribing habits must be viewed very critically. 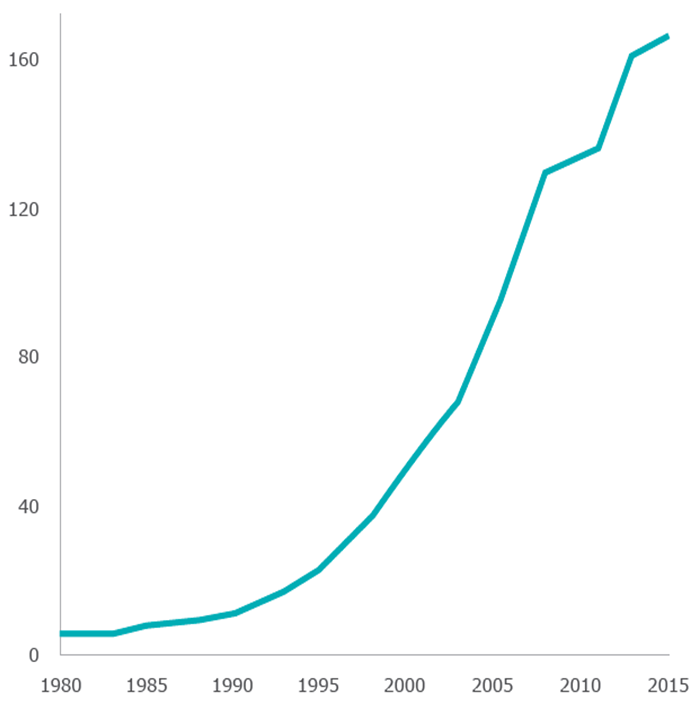 Figure 1: European Total Opioid Consumption 1990-2015 (mg/capita). Increased surveillance to track rates of abuse and monitor for signs of effectiveness. As Figure 1 shows, Europeans are consuming ever increasing amounts of opioids. Europe has the opportunity to learn from the North American experience and, in doing so, avoid its own opioid epidemic. Without due attention this possibility is a real one, as this article will discuss. In order to address prescription opioid abuse it’s essential to understand why such drugs are necessary; attempts to prevent abuse cannot limit access to patients. It is a cliché to point out that we live in an ageing world, but it is evidently true. From 1990 to 2014, the life expectancy for an adult in the EU grew by some six years.5 It is also a cliché that with greater age comes greater pain, but sadly this also is true; approximately 20% of European adults suffer from chronic pain and the prevalence is greater in older people.6 If not well treated, chronic pain sufferers are more likely to be depressed, take more time off work and, despite the general upward trend, have a lower life expectancy,7 all of which poses a significant societal cost. Effective remedies like prescription opioids are needed to address the growing incidence of chronic pain. 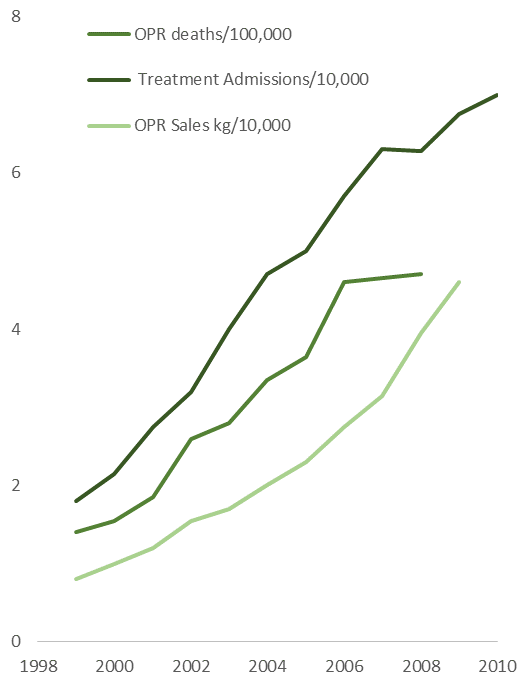 Figure 2: Rates of opioid pain reliever (OPR) overdose death, treatment admissions, and kilograms of OPR sold, 1999–2010. The path from abuse of prescription drugs to addiction and death has been described many times. 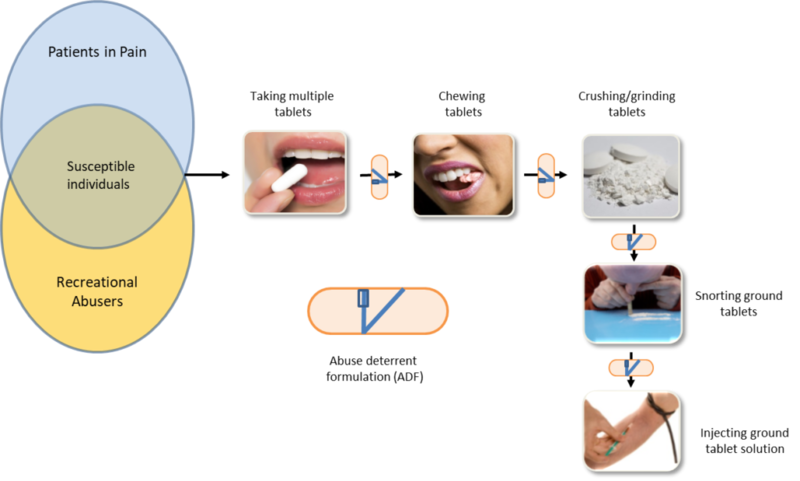 Figure 3 summarises this principle, beginning with susceptible patients swallowing multiple tablets to achieve euphoria. As tolerance and dependence take hold, such behaviours may progress to more dangerous forms of abuse where tablets are chewed before swallowing to release drug more rapidly, an approach to which extended release tablets containing large amounts of drug have been particularly vulnerable. When chewing no longer satisfies an addiction, tablets may then be crushed and snorted (insufflation) or crushed and mixed with liquids and injected, a case in which overdose is common. Figure 3: Addiction to opioids and other controlled substances may occur from prolonged exposure to licit prescriptions, or through illicit recreational abuse. In both cases, oral abuse begins a pathway commonly progressing from taking multiple tablets, to chewing whole tablets to snorting or injection of ground tablets. Non-oral routes are more likely to result in overdose. Abuse deterrent formulations allow intervention at each stage of the progression. Early intervention may prevent progression to more dangerous routes of abuse. 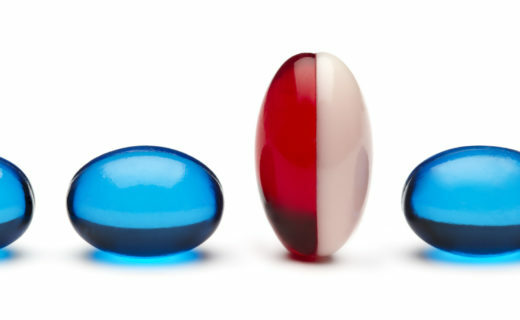 Figure 4: The hard, coloured gel that forms immediately when Intellitab™ tablets are ground and added to liquids. Physicochemical Barrier Technologies – Here, tablets are hardened to make them difficult to chew and resistant to crushing and grinding. Realising that no technology is immune to such attempts, technologies may also include excipients that swell in the presence of liquids to form a viscous gel that reduces the potential for injection. Examples of such technologies include heat-treatment recrystalisation (HTR), used on reformulated OxyContin® (Purdue Pharma, Stamford, CT, US), DETERx®, employed by Collegium Pharma (Canton, MA, US), and INTELLITAB™, developed by Altus Formulation (Figure 4). Agonist/Antagonist Technologies – In this case, formulations comprise a separate antagonist included to counteract the effect of the opioid narcotic should the tablets be tampered with prior to ingestion. Whilst these products do not prevent the abuse per se, they are nevertheless designed to prevent harmful outcomes should abuse occur. Examples of products using this approach include Embeda®, a morphine sulphate/naltrexone formulation marketed by Pfizer, and Targiniq®, an oxycodone/naloxone formulation developed (but never marketed) by Purdue Pharma. Effectiveness – Experience has proven seat belts to be effective and the same can be said of ADFs. For example, Severtson et al20 and Dart et al21 report, amongst other positive trends, that introduction of HTR barrier technology resulted in a reduction of 75% in the number of intentional abuse cases presenting to poison control centres and a reduction of 87% in the amount of non-oral abuse of the product. Simplicity – All abuse deterrent formulations are simple to use since, in appearance and administration, they are identical to any other tablet. Simplicity must also extend to manufacturing, as simpler processes lead to lower costs. Barrier technologies which eschew the two active ingredients required by agonist/antagonist formulations may have the advantage here. Cost – The North American experience has shown us that branded ADF products are not easily affordable with prices of US$20 (£15) per tablet and above being commonplace. Such pricing will likely prohibit the introduction of ADFs and their benefits to the European market. In our view, an ADF formulation should cost little more to the payer than a non-abuse deterrent formulation so that access can be assured. As championed by the US FDA, the introduction of value-added ADF bioequivalents to currently marketed products would be a simple first step in providing safer-to-use tablets to patients, without opening the door to excessive pricing, so long as such products were clearly differentiated in their labels. New regulation to ensure any new drug with abuse potential is formulated with abuse deterrent technology from the outset would be a logical follow up, which would enhance and encourage innovation. Effective surveillance is mandatory for effective tracking of any regulatory strategy. In the case of prescription drug abuse, it is needed both to monitor the benefit (or otherwise) of any new ADF product and to track the emergence of new drugs that would benefit from ADF technology to mitigate their abuse potential. Opioids, while a critically important case, are not the only drug that could benefit from an ADF approach. For example, the popular press has recently highlighted abuse of gabapentinoids and benzodiazapines. In the US pre- and post-marketing surveillance of opioid medications has led to the approval of new products by the FDA and, just as importantly, the removal of products because of their abuse potential.22 In Europe, however, the lack of such mosaic systems providing accurate, immediately available, geographically relevant, product-specific information is a hindrance both to understanding the extent of abuse in member states and to effective prevention. Multiple input mosaic surveillance systems, for example comprising data streams from the criminal justice system, treatment professionals, susceptible patient populations and acute health events, in parallel with the cost-effective introduction of ADFs, represent an invaluable tool to combat prescription drug abuse and prevent repetition of the North American experience in Europe. Whether or not Europe has an opioid problem may be debated, as Europe lacks the surveillance systems to monitor this adequately. What is clear, however, is that increases in the rates of opioid consumption are tracking those seen in North America and the potential for increased abuse is therefore present and growing. The introduction of ADFs as a preventative measure to mitigate the potential for abuse offers a cost-effective approach to minimise the human and societal costs of abuse. Linked with effective surveillance we believe such measures should be adopted sooner rather than later. Zezima K, Higham S, “Drug executives express regret over opioid crisis, one tells Congress his company contributed to the epidemic”. Washington Post, May 2018. “Apparent opioid-related deaths”. Government of Canada, Mar 2018. Dart RC et al, “Trends in opioid analgesic abuse and mortality in the United States”. N Engl J Med, Jan 2015, Vol 372(3), pp 241–248. “Health at a Glance: Europe 2016 – State of Health in the EU Cycle”. OECD and European Commission, Nov 2016.
van Hecke O, Torrance N, Smith BH, “Chronic pain epidemiology and its clinical relevance”. Br J Anaesth, Jul 2013, Vol 111(1), pp 13–18. Zimmer Z, Rubin S, “Life expectancy with and without pain in the US elderly population”. J Gerontol A Biol Sci Med Sci, Sep 2016, Vol 71(9), 1171–1176. Sarganas G et al, “Prevalence, trends, patterns and associations of analgesic use in Germany”. BMC Pharmacol Toxicol, 2015, Vol 16, p 28. Ruscitto A, Smith BH, Guthrie B, “Changes in opioid and other analgesic use 1995–2010: Repeated cross-sectional analysis of dispensed prescribing for a large geographical population in Scotland”. Eur J Pain, Jan 2015, Vol 19(1), pp 59–66. Zin CS, Chen LC, Knaggs RD, “Changes in trends and pattern of strong opioid prescribing in primary care”. Eur J Pain, Oct 2014, Vol 18(9), pp 1343–1351. Abbott TEF et al, “Frequency of surgical treatment and related hospital procedures in the UK: a national ecological study using hospital episode statistics”. Br J Anaesth, Aug 2017, Vol 119(2), pp 249–257. Feizerfan A, Sheh G, “Transition from acute to chronic pain”. Continuing Education in Anaesthesia Critical Care & Pain, Apr 2015, Vol 15(2), pp 98–102. Hanks GW et al, “Morphine and alternative opioids in cancer pain: the EAPC recommendations”. Br J Cancer, Mar 2001, Vol 84(5), pp 587–593. Doleman B et al, “Preventive opioids for postoperative pain”. Cochrane Database of Systematic Reviews, Apr 2017, Issue 4. “Analgesic use”. British Medical Association, Mar 2017 (Updated Mar 2018). Greener M, “Will the UK face an opioid abuse epidemic?”. Prescriber, Aug 2017, Vol 28(8), pp 36–38. Hider-Mlynarz K, Cavalié P, Maison P, “Trends in analgesic consumption in France over the last 10 years and comparison of patterns across Europe”. Br J Clin Pharmacol, Jun 2018, Vol 84(6), pp 1324–1334. Dunn MK et al, “Overdose and prescribed opioids: Associations among chronic non-cancer pain patients”. Ann Intern Med, Jan 2010, Vol 152(2), pp 85–92. Green JL et al, “Medical outcomes associated with prescription drug abuse via oral and non-oral routes of administration”. Drug Alcohol Depend, Jun 2017, Vol 175, pp 140–145. Severtson SG et al, “Sustained reduction of diversion and abuse after introduction of an abuse deterrent formulation of extended release oxycodone”. Drug Alcohol Depend, Nov 2016, Vol 168, pp 219–229. Dart RC et al, “Do abuse deterrent opioid formulations work?” J Opioid Manag, Nov/Dec 2017, Vol 13(6), pp 365–378. “FDA requests removal of Opana ER for risks related to abuse”. US FDA News Release, Jun 2017. 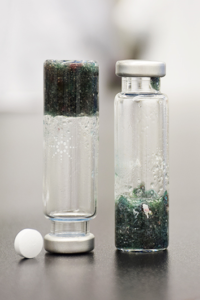 S Mohan Mohanraj and Meir Kende discuss the development of a microsphere based delivery system for an orally administered anthrax vaccine.